You’ll earn 2% cash back on $1,000 worth of gas station and restaurant purchases combined, each quarter. All other purchases will earn 1% cash back, including gas and restaurant spending after you’ve hit the $1,000 limit. But perhaps the most significant rewards feature of this card is the fact that Discover will match, dollar-for-dollar, all the cash back you earn over your first year as a cardholder. During your first 14 months with an account you’ll receive a 0% introductory APR on purchases, as well as balance transfers. There’s also no annual membership fee or foreign transaction charges, as well as no late payment fee for the first late payment. In fact, your APR won’t be raised when you make a late payment. If you’re someone who has struggled with late payments in the past, this is likely welcome news. 0% introductory APR - As a new cardholder, you’ll receive a 14-month, 0% introductory APR on purchases and balance transfers. Following this offer, your APR will fall between 14.24%-25.24% Variable. 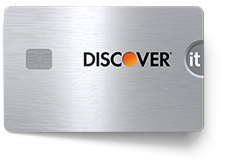 No annual fee - You won’t be required to pay a yearly membership charge to remain a Discover it® chrome cardholder. No foreign transaction fees - If you’re taking a trip outside of U.S., you can bring your Discover it® chrome card with you, as you won’t be charged foreign transaction fees on any purchases you make. $0 fee on your first late payment, no APR hike - The first time you make a late payment on your monthly bill, you will not be charged a late fee for doing so. And a late payment will never result in an interest rate hike. Get up to 2% cash back - For every $1,000 you spend each quarter at gas stations and restaurants combined, you will earn 2% cash back. Once you’ve reached that limit, you’ll earn 1% cash back. All other purchases you make will also receive 1% cash back. Double your first-year cash back total - The total amount of cash back you’ve accumulated after your first 12 months with the card will be matched by Discover. Cash back redemption choices - There are five main ways you can redeem the cash back you’re earning daily, including direct deposits, statement credits, gift cards, Amazon.com checkout credit or charitable donations. No minimums or expirations - You can begin redeeming your cash back as soon or as late as you’d like to, with no expiration dates or redemption minimums placed on your earnings. Monthly FICO® score free - Each month, you’ll be given unlimited access to your FICO® credit score free, giving you a peek into how well your credit is doing. On/off account freeze switch - Shutting off your account at a moment’s notice can be done through Discover’s website and mobile app. This will continue to allow recurring charges, returns, credits and more to go through, however new purchases will be blocked. $0 fraud liability - When you see an unauthorized purchase made on your account, let Discover know and it’ll stop it from going through. Discover app and website - It’s fairly simple to keep track of your cash back rewards and card balances through Discover’s cardholder website and mobile app. The Discover it® chrome offers rewards on gas station and restaurant purchases as follows: Each quarter, a maximum of $1,000 spent between gas and dining out combined will be afforded 2% cash back, whereas everything else you purchase will receive 1% cash back. Once the 2% cash back categories reach their limit, they’ll earn that 1% as well. All the cash back you build up over your first year as a cardholder will ultimately be matched by Discover at the end of that year, essentially doubling your rewards earnings in the process. This accumulated cash back can be redeemed in a few different ways, including as a statement credit, direct deposit, gift card, Amazon.com checkout credit or a charitable donation. If you choose the Amazon option, your cash back credit will be available to be applied directly at the checkout of your cart’s purchases. Your cash back will not expire as long as your account remains open, and there’s no minimum to begin redeeming, except for gift cards, which require at least $20 to do so. The first late payment you make on your card won’t be charged a fee. Future late payments will incur a $37 fee. However Discover won’t raise your APR immediately following a late payment, a far cry from what some of its competitors do. You can use Discover’s website and mobile app to keep a close eye on everything that has to do with your Discover it® chrome, including your cash back total, redemption options, balances and more. Though it is possible to earn solid cash back rewards with the Discover it® chrome, it does lack higher percentage cash back offers. For instance, some cash back cards offer 3% to 5% back, even if they are limited to specific amounts. Your cash back rewards begin with 2% cash back on gas and restaurant purchases, and 1% cash back on everything else. That 2% rewards level is limited to $1,000 combined between the two categories each quarter, with that rate restarting following that time period. At the conclusion of your first year as a cardholder, whatever sum of cash back you earned will be matched, and therefore doubled, by Discover. Balance transfer candidates should take a look at the Discover it® chrome. Its 0% introductory APR for 14 months on balance transfers is a great offer that could save you some money on your existing credit card debt. The reasonable 14.24%-25.24% Variable APR range that follows that intro offer will also keep your APR at a solid level if you’re unable to pay off your balance transfer during the allotted 14-month period. The 3% balance transfer fee associated with this card also provides a low initial cost for taking this interest-cutting route. 0% introductory APR for 14 months from date of account opening. After the intro APR expires, your APR will be 14.24%-25.24%, based on your creditworthiness. This APR will vary with the market based on the Prime Rate. 0% introductory APR for 14 months from date of first transfer. After the intro APR expires, your APR will be 14.24%-25.24%, based on your creditworthiness. This APR will vary with the market based on the Prime Rate. 27.24% Variable. This APR will vary with the market based on the Prime Rate. Balance Transfers 3% of the amount of each transfer. Late Payment None the first time. After that, up to $37. Returned Payment Up to $37. For those who frequently spend on gas and dining out, the Discover it® chrome could be your match made in heaven. But how does it compare to the ever popular Blue Cash Everyday® Card from American Express? The Amex Card offers 3% cash back at U.S. supermarkets for up to $6,000 yearly (then 1%). In contrast, 2% cash back on every $1,000 you spend each quarter combined between gas and restaurants is the highest rate you’ll find with Discover. Amex subsequently also gives 2% cash back at U.S. gas stations and select U.S. department stores and 1% cash back everywhere else. With those extra rewards possibilities comes a higher fee and interest rate structure for the Blue Cash Everyday® Card. Though you will get a 0% introductory APR for a month longer than Discover, your post-intro APR range will be 1% to 2% higher at 15.24% - 26.24% variable. You’ll be subjected to a 29.99% variable penalty APR and a 2.7% foreign transaction fee as well -- two things you’ll find lacking with the Discover Card. Therefore if you’re willing to pay more to remain a cardholder, you’ll earn better rewards, as the Amex Card has proven here. But if lower card maintenance costs is what you’re after, even with a small sacrifice of your cash back totals, the Discover it® chrome is undoubtedly where you should be. Overall, you should feel extremely confident in applying for the Discover it® chrome card, as it ensures that you’re earning cash back for a solid portion of your daily buys. Discover’s matching of your first year rewards total is a unique offer in comparison to other similar cards. At the same time, Discover focuses on keeping those rewards in your pocket with low fees and APRs, including a 0% introductory APR for 14 months, no annual fee and no foreign transaction charges. Considering all the features of this card, put it on your short list of cash back options.